I swear. I’m not sleeping with the Newsday Chief editor. They are just in a very kind and generous mood this month! 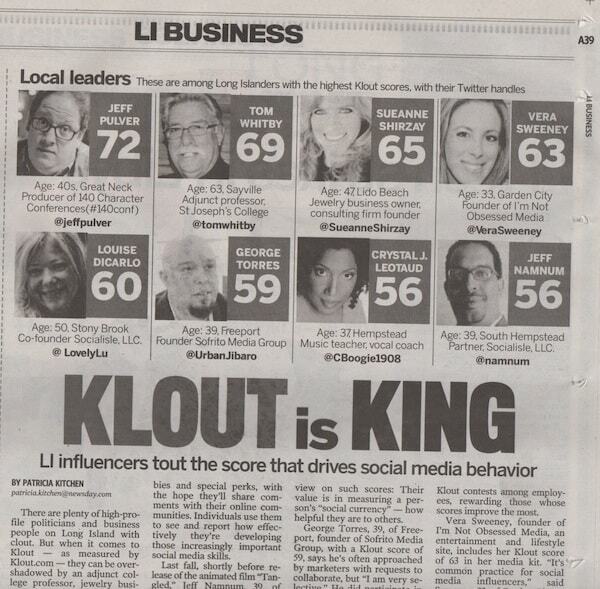 Last week, Newsday named me number one on their Top 5 Long Island Social Media Influencer list and today they’ve included me in their article regarding Klout scores (I am number 4 on the island – woot! woot!). I even gave a quote for the piece – but it isn’t very meaty. Thanks to Newsday again for showing me some love. GIRL YOU DESERVE IT!!!! So proud of you!! That’s so great! How many cool points did you score w/ the kids with having your picture in the paper??? Congrats! That is fantastic! And great free publicity for your sites! Woot!! !